Professor Stephen William Hawking was born in 1942 to the Research Biologist Dr Frank Hawking and his wife Isobel. Born in the midst of World War II, he started life in the safer vicinity of Oxford rather than London where his parents lived in Highgate, but later moved to St Albans in 1950. 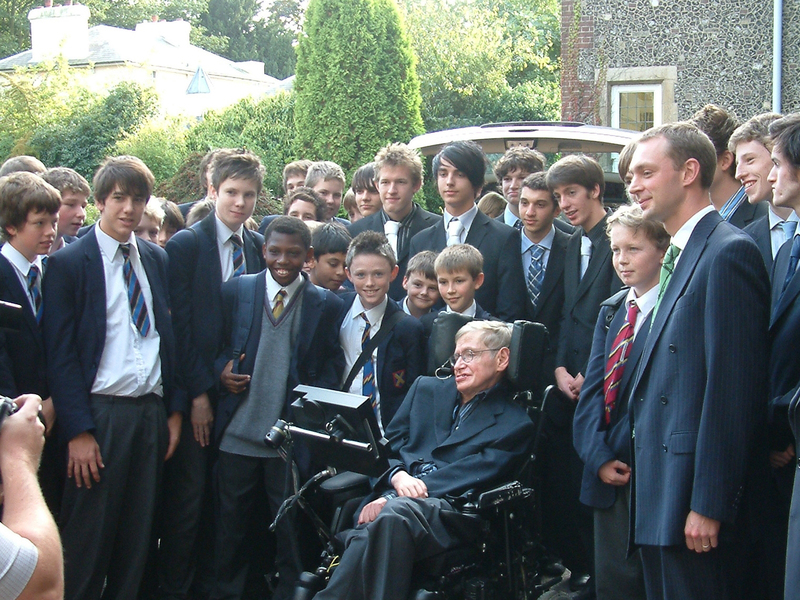 For a short time, Hawking attended St Albans High School for Girls, which was then open to boys until the age of 10. He then attended St Albans School and until the time of his passing, considered his Mathematics Teacher, the late Dikran Tahta, as an inspiration. Together, Hawking and Tahta built his first computer, made with electro-mechanical switches. When speaking about Tahta, Hawking recently said, “…behind every exceptional person, there is an exceptional teacher”. Hawking went on to study at University College, Oxford, where he read Physics. He was awarded a first class honours degree in Natural Sciences three years later. Following that, Hawking went to the University of Cambridge, where he studied Cosmology and began his scientific career of international repute that has spanned over 40 years. All this he achieved despite suffering from Motor Neurone Disease from the age of 21. By 1986, his only means of communication was by electronic voice – a feature now recognised worldwide. Hawking is arguably best known for his contribution to the fields of quantum gravity and cosmology, especially in the context of black holes. Hawking’s key scientific works to date have included providing, with Roger Penrose, theorems regarding gravitational singularities in the framework of general relativity, which imply space and time have a beginning in the Big Bang and an end in black holes. As well as the theoretical prediction that black holes should emit 50 51 radiation and eventually evaporate and disappear, which is today known as Hawking radiation (or sometimes as Bekenstein–Hawking radiation). Another theory of his is that the universe has no edge or boundary in imaginary time, meaning the universe’s beginning was determined by the laws of science. Hawking achieved major success through his book A Brief History of Time, which discusses his own theories and cosmology in general. The book stayed on the British Sunday Times bestsellers’ list for a record-breaking 237 weeks. Other publications include My Brief History, The Grand Design, The Universe in a Nutshell, and Black Holes and Baby Universes and Other Essays, amongst others. For 30 years, Hawking was the Lucasian Professor of Mathematics at the University of Cambridge, from 1979 to 2009. He also held the position of the Dennis Stanton Avery and Sally Tsui Wong-Avery Director of Research at the Department of Applied Mathematics and Theoretical Physics (DAMTP) at the University of Cambridge. He was a Professorial Fellow of Gonville and Caius College, Cambridge, and a Distinguished Research Chair at the Perimeter Institute for Theoretical Physics in Waterloo, Ontario. He was also the Founder of the Centre for Theoretical Cosmology (CTC) at Cambridge, and has led DAMTP’s General Relativity Group for over 30 years. Since 1997, he was the COSMOS National Cosmology Supercomputer’s Principal Investigator. Hawking’s status as a Theoretical Physicist and Cosmologist, together with his books and public appearances, have made him an academic celebrity. He was an Honorary Fellow of the Royal Society of Arts, as well as being a lifetime member of the Pontifical Academy of Sciences and a member of the US National Academy of Sciences. In 2009, he was awarded the Presidential Medal of Freedom – the highest civilian award in the United States. In 1982, Hawking was awarded a CBE and became a Companion of Honour in 1989. Overall, he has received over twelve honorary degrees, the most recent of which was the Honorary Degree of Doctor of Science from Imperial College, London, in July 2017. He received numerous other medals, awards and prizes. In 2014, a film about his life was released. The Theory of Everything starred Eddie Redmayne as Professor Hawking, for which Redmayne went on to win an Oscar. The film recounts the Professor’s early life and his diagnosis of MND. Professor Hawking continued to research theoretical physics, touring the world presenting public lectures, both as a scientist and as a political commentator.